So you’ve read Part I of this series – How to Choose a dog friendly Campsite – and you’re ready to head out for your first camping trip with your dog. But what do you bring with you? The best thing about car camping is that you can pretty much bring whatever you want. When you go backpacking, you’ll choose to scrimp to save weight on your pack but weight doesn’t matter in the car so… BRING ALL THE THINGS! Below is my list of essentials you need for camping with your dog. There is a lot of gear available for camping but I focused on the most important stuff – things that are absolute necessities plus a few extras to make your experience more enjoyable for you and your pup. This will be your shelter while you are sleeping in the outdoors. It will keep bugs from biting you while your sleeping, act as a mental barrier between you and “the wild”, and keep the rain off of you if you bring one with a waterproof cover or rainfly (one that covers the whole tent is best). Bring a foam pad or inflatable mattress to act as a barrier between you and the cold, hard ground. Car camping is the one outdoor experience where you will be able to sleep in luxury. If you have a huge tent, you can bring a big inflatable mattress – the kind you blow up in the living room for your guests to sleep on. Those need a pump to blow them up though so make sure to bring one with a battery operated pump or make sure you have access to an electrical outlet (RV hookup at the site or in your car – my 4-Runner has a regular household electrical outlet in the back). Go ahead and bring your sheets, blankets, and pillows from home. No need to scrimp on a good nights sleep! If you are using a smaller backpacking tent, bring a smaller foam pad or thin, inflatable one. It’s easier to use a sleeping bag in these situations instead of blankets from home. One reason is that it will help keep you bundled up tight and ON the sleeping pad you brought. It gets cold at night in most places (it can get cold even in the desert) so bring a warm jacket, hat, and gloves just in case. A pair of socks to keep your feet warm at night are nice to have too. An added bonus is that covering dirty feet with socks can help keep your bedding clean. As for the rest of your clothes, you can bring regular clothes from home. Don’t bring your nice ones though because they will get dirty or might get ruined. If you have hiking-specific or gym clothes, you might want to bring those because they keep you warm even when wet (unlike cotton) and dry faster. If you are visiting a mountain climate, or an area where it could possibly rain, bring a rain pants and a jacket. You might be VERY glad you did. 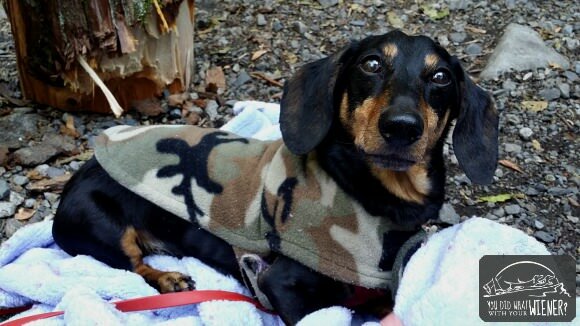 Bring a jacket or two (in case one gets wet or dirty) for your dog to keep them warm and as dry as possible around camp. Bring a towel, extra roll of toilet paper in case the bathroom at your campground runs out, and personal hygiene products from home like toothbrush, hair brush, lotion, and deodorant. If you’re lucky, your campsite will have a shower. If not, and you want to try and stay clean, I suggest bringing something like Action Wipes to take a “sponge bath” every day. Bring an extra towel or two just for the dog. Even if they are not swimming, they can get muddy. Microfiber towels take up less room in your car and, more importantly, dry quicker. We recommend the PackTowl Luxe. It doesn’t feel as “sticky” as most soft microfiber towels and actually attracts dirt and water (not like those thin chamois ones). Also bring dog grooming wipes or bath spray to take care of bigger messes, like if they roll in something. Camp is more pleasant if you dog doesn’t smell and cleaning them before they go in the tent at night will help keep the inside clean. UPDATE: Bug Spray. I forgot to list the bug spray. Don’t forget the bug spray! Nothing can ruin a trip quicker than you or your dog getting eaten by bugs and, possibly, having an allergic reaction. Our favorite natural, pet-safe bug repellent is Wondercide Flea & Tick for Pets. Note: If you’re camping in an area with wildlife, store ALL your toiletries in the car and never in the tent with you. Tooth paste and deodorant smell like food to them. Bring a big cooler full of food and cold drinks. Hey, you can even bring two if you want because you are in a car. Bring those steaks, ALL of the hamburger fixings, pancake mix and blueberries, jug of syrup, eggs, favorite beer or wine, etc. The food you can eat while car camping is like a high-class meal compared to what you eat while backpacking. If you feed your dog raw, and you will only be gone for a night or two, you might be able to keep the raw meals on ice. If you worry about your dog’s raw food going bad, you can bring a freeze-dried raw food like TruDog FEED ME. Note: Beware of your food around wildlife. If raccoons and chipmunks are your biggest worries, your food will be safe (and you will help keep wildlife safe) by putting EVERYTHING in the car at night. Yes, even paper towels. Critters would love to tear them up and use them for betting material. If you are camping where there are bears, you will probably know it because there will be signs and a special “vault” (provided by the campground) to store your food in at night. Never keep your food in your tent. It’s prohibited to gather firewood in most established campgrounds so you’ll need to provide your own. So you don’t spread tree diseases and bugs, you shouldn’t bring campfire wood from home. It’s actually prohibited in some areas. Wood can be purchased at a grocery store, convenience store, or private seller on the way to the campground. Some campgrounds will have a “host” (a volunteer to keep and eye on the place) and they often sell firewood. The majority of these firewood bundles will not come with smaller kindling so bring a small hatchet to split a larger piece of wood. Be sure to bring a lighter/matches and some paper from home to help get the flame going. There are times of the year, in certain locations, where fire danger is high and air quality is low so campfires aren’t allowed (check before you go to avoid surprise but signs should also be posted at the campground). Most camp sites will have a fire pit. 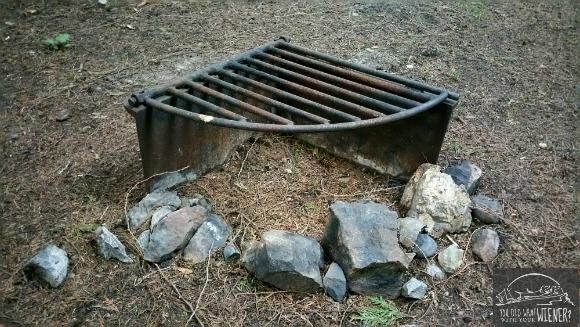 You can cook over the fire but the grate is almost never suitable for cooking on directly – the slots are too big between the bars and they’re rusty. If you plan to cook on the fire, bring tin foil, a pot (get a cheap one from Target or a thrift store – don’t use a good one from home) to set on top of the grate. You can avoid that issue all together if you bring hot dogs and a roasting stick. You might want to bring a small camp stove for quickly heating up water for coffee in the morning. People (*ahem* my hubby) who really need coffee in the morning can be unpleasant if they haven’t had it. You don’t want to wait for someone to get it together enough to build a fire, and for the fire to heat up, before they can drink the “magic potion”. 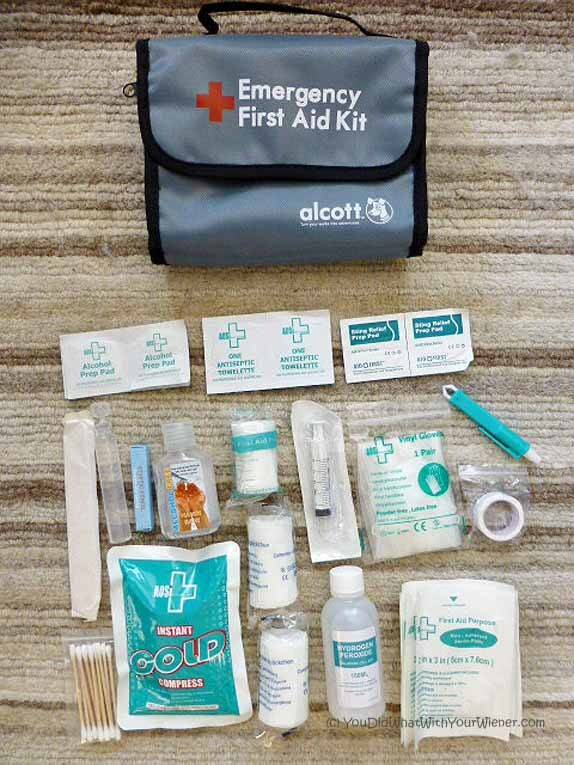 Accidents can happen at camp so be prepared with a first aid kit. A first aid kit for car camping doesn’t have to be fancy because you will likely be within driving distance of a doctor or veterinarian. Be sure to bring a first aid kit for your dog too (or add dog-specific supplies to yours). And do one better – take a pet first aid class so you’re prepared to handle little emergencies like allergic reactions, poisoning, or big cuts on your own. You’re, of course, going to want something to help you see at night. A campfire provides a lot of light but but there will be times it’s out like when you need to use the bathroom in the middle of the night or there is an emergency and you have to pack up camp in the middle of the night. I highly recommend skipping the flashlight and going straight for the headlamp. It’s something you can always use around the home when you need to keep your hands free. After a headlamp, if you want to get fancy, invest in a lantern for the times you don’t want be wearing a headlamp like changing in the tent. Bring a little light like the Nite Ize SpotLit for your dog to wear at night. That will help you keep tabs on where they are, what they may be getting into, and will help prevent people tripping over them. Let’s be realistic. Many people don’t totally unplug when they go camping. You may want to share pictures of your adventure on social media. Some people , like me, work independently and sometimes have to work an hour or two in the morning. Bringing a radio is nice to break up silence and drown out little noises (but keep it just loud enough for your camp to hear it). Don’t forget a portable charger for your phone and camera! You won’t get cell service at all campgrounds. If that’s the case, take the opportunity to focus on exploring, time with friends, and enjoying the “unplugged” life. There are many campgrounds where you can get cell service at your site, or nearby, though. Some private campgrounds might even have free Wi-fi. Letting your dog roam to the next campsite is uncool and you’ll get labeled “rude camper”. Have a way to tie up your dog so they don’t wander. When I am car camping, I bring our SUREswivel 360 degree Swiveling Pet Tie-Out. You can also tie a long lead around a picnic table leg but be prepared to keep untangling it. Note: Tying a rope between two trees like a zipline and tethering your dog to that is not recommended. Tying things around a tree can damage the bark and cause the tree to die. Also, be conscious at night that your dog does’t drag the leash across the fire and burn a hole it (or a whole section of it). So, where do I get this stuff? If there is stuff on this list that you don’t have, and you’re not sure you like camping, I suggest borrowing stuff from friends, renting, or buying descent-quality but cheap stuff from a discount website. You don’t want to make a big investment if you’re not sure you like camping yet. Also, you could pay a lot of top-of-the-line stuff and find out that you don’t like what you bought – it doesn’t work for you or doesn’t have the bells and whistles you want. It’s better to buy something that is low enough cost that it won’t matter if you only use it a few times (although some of this stuff will last forever – I used my first, cheap camping stove for almost 10 years), learn what you like and don’t like, and upgrade to more expensive gear that is exactly what you want later. A pawfect comprehensive look at car camping & wooftastic giveaway! And now I will not be going camping. I just remembered that the one time I went camping and loved it – someone else took care of everything for me. I had no idea that there was so much work. Thanks for such a thorough list. Hi Natalie. Yes, this article does only address camping stuff. The rest of my blog is focused on providing for the dog and I have written many times about things they would need camping like jackets. Below is one of my most popular posts on that topic. Let me know if you have any other questions. I hope you have many more happy (and comfortable) adventures.